حسینی فرد, سید مهدی, قربانی, هادی, آقازاده, مصطفی, حسینی فرد, مجتبی. (1395). سنتز نانوذرات دی‌اکسید منگنز و ارزیابی عملکرد آن در حذف مس از محلول‌های آبی. مجله آب و فاضلاب, 27(3), 2-11. سید مهدی حسینی فرد; هادی قربانی; مصطفی آقازاده; مجتبی حسینی فرد. "سنتز نانوذرات دی‌اکسید منگنز و ارزیابی عملکرد آن در حذف مس از محلول‌های آبی". مجله آب و فاضلاب, 27, 3, 1395, 2-11. حسینی فرد, سید مهدی, قربانی, هادی, آقازاده, مصطفی, حسینی فرد, مجتبی. (1395). 'سنتز نانوذرات دی‌اکسید منگنز و ارزیابی عملکرد آن در حذف مس از محلول‌های آبی', مجله آب و فاضلاب, 27(3), pp. 2-11. حسینی فرد, سید مهدی, قربانی, هادی, آقازاده, مصطفی, حسینی فرد, مجتبی. سنتز نانوذرات دی‌اکسید منگنز و ارزیابی عملکرد آن در حذف مس از محلول‌های آبی. مجله آب و فاضلاب, 1395; 27(3): 2-11. در این پژوهش حذف مس از محلول‌های آبی با استفاده از نانوذرات دی‌اکسید منگنز به‌عنوان جاذب مناسب و جدید مورد بررسی قرار گرفت. به این منظور نانوذرات دی‌اکسید منگنز به‌روش ترسیب الکتروشیمیایی کاتدی سنتز شدند و تأثیر پارامترهای pH، زمان تماس، غلظت جاذب و اثر غلظت اولیه بر فرایند جذب مس در سیستم ناپیوسته مطالعه شد. برای تعیین ویژگی‌های نانوذرات دی‌اکسید منگنز، از میکروسکوپ الکترونی روبشی، دستگاه پراش پرتو ایکس و دستگاه طیف‌سنج مادون قرمز استفاده شد که نتایج حاصل، اندازه متوسط این نانوذرات را بین 30 تا 50 نانومتر نشان داد. نتایج نشان داد که با افزایش pH محلول آبی از 3 تا 7، ظرفیت جذب مس افزایش می‌یابد، به‌طوری که در pH بهینه برابر با 7، میزان جذب با مقدار بیش از 96 درصد، به حداکثر خود رسید. همچنین افزایش زمان تماس و میزان جاذب باعث افزایش راندمان حذف شد و نتایج نشان داد که با افزایش غلظت مس، ظرفیت جذب افزایش می‌یابد. 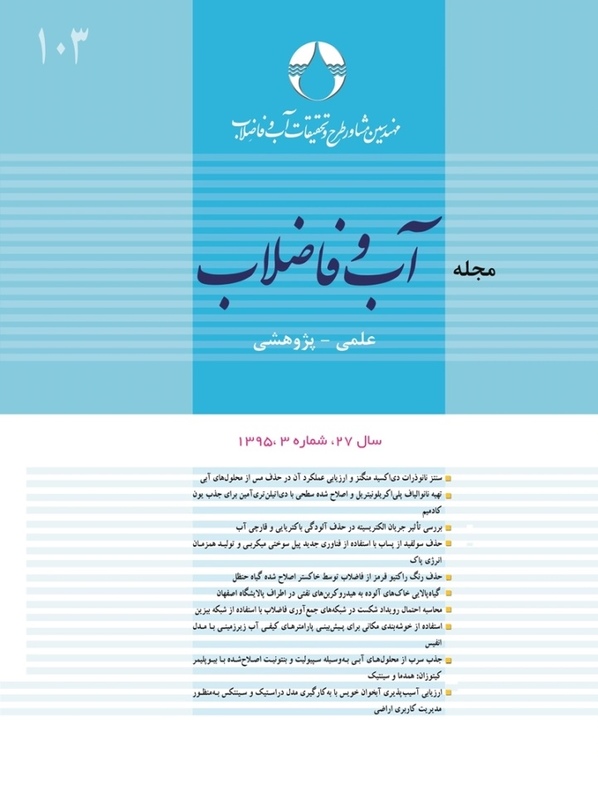 در بررسی ایزوترم‌های جذب، داده‌های آزمایشی مطابقت بیشتری با مدل فروندلیچ با ظرفیت جذب بیش از 169 میلی‌گرم بر گرم نشان دادند. همچنین داده‌های به‌دست آمده برای جاذب نشان داد که جذب مس از مدل سینتیک شبه مرتبه دوم تبعیت می‌کند. به‌طور کلی نتایج این پژوهش نشان داد که استفاده از نانوذرات دی‌اکسید منگنز، یک روش مناسب با پتانسیل بالا در حذف مس از محلول‌های آبی است. Removal of copper from aqueous solutions was investigated using manganese dioxide nanoparticles as a new and suitable adsorbent. For this purpose, manganese dioxide nanoparticles were synthesized using the cathode electrochemical deposition method and the effects of pH, contact time, MnO2 concentration, and copper concentration on copper removal efficiency were investigated in a batch system. Scanning electron microscope (SEM), XRD, and FTIR were used to characterize the synthesized manganese dioxide nanoparticles. Results showed that nanoparticle diameters ranged from 30 to 50 nm and that a copper adsorption efficiency of bove 96% percent would be achieved at an optimum pH of 7. It was found that increasing the copper concentration and reducing adsorbent dosage led to enhancements in adsorption capacity but slight reductions in adsorption efficiency. Experimental data also indicated that copper adsorption fitted the Freundlich model with an adsorption capacity of above 169 mg.g‒1 and that it obeyed a pseudo-second order kinetic equation. It was concluded that manganese dioxide nanoparticles may be used as a suitable adsorbent with a high potential for the removal of copper from aqueous solutions. 1. Sobhi, N. (1998). “Removal of heavy metals from industrial wastewater by ash [dissertation].” Tarbiat Modarres University, Tehran. (In Persian). 2. Xu, J., Yang, L., Wang, Z., Dong, G., Huang, J., and Wang, Y. (2006). “Toxicity of copper on rice growth and accumulation of copper in rice grain in copper contaminated soil.” J. of Chemosphere, 62, 602-607. 3. Gadupudi, P. R., Chungsying, L., and Fengsheng, S. (2007). “Sorption of divalent metal ions from aqueous solution by carbon nanotubes.” Separation and Purification Technology, 58, 224-231. 4. Zhuang, H.L., Zheng G.P., and Soh A.K. (2008). “Interactions between transition metals and defe carbon nanotubes.” Computational Materials Science, 43, 823-828. 5. Karabulut, S., Karabakan, A., Denizli, A., and Yu¨ru¨m, Y. (2000). “Batch removal of copper(II) and zinc(II) from aqueous solutions with low rank.” Turkish Coals. Sep Purif Technol., 18, 177-184. 6. Juang, R.S., Lin, S.H., and Wang, T.Y. (2003). “Removal of metal ions from the complexed solutions in fixed bed using a strong-acid ion exchange resin.” Chemosphere, 53(10), 1221-1228. 8. Chen, J.H., Wang, Y.J., Cui, Y.X., Wang, S.Q., and Chen, Y.C. (2010). “Adsorption and desorption of Cu (II), Zn (II), Pb (II), and Cd (II) on the soils amended with nanoscale hydroxyapatite.” J. of Environmental Progress and Sustainable Energy, 29(2), 233-241. 9. Zaman, M.I. , Mustafa, S., Khan, S., and Xing, B. (2009). “Effect of phosphate complexation on Cd2+ sorption by manganese dioxide (ˇ-MnO2). ” J. Colloid Interface Sci., 330, 9-19. 10. Su, Q., Pan, B., Wan, S., Zhang, W., and Lv, L. (2010). “Use of hydrous manganese dioxide as a potential sorbent for selective removal of lead, cadmium, and zinc ions from water.” J. Colloid Interface Sci., 349, 607-612. 11. Yueming, R., Ni, Y., Jing, F., Jun, M., Qing, W., Nan, L., and Qing, D. (2012). “Adsorption mechanism of copper and lead ions onto graphene nanosheet/d-MnO2.” Materials Chemistry and Physics,136, 538-544. 12. Chao, L., Rongyan, W., Dan, G., Shengfang, Z., and Shiqiang, Y., (2013). “Adsorption behavior of MnO2 functionalized multi-walled carbon nanotubes for the removal of cadmium from aqueous solutions.” Chemical Engineering Journal, 225, 406-415. 13. Shih, H., and Dong, H. (2009). “Rapid removal of heavy metal cations and Anion from aqueous solutions by anamino-functionalized magnetic nano-adsorbent.” J. of Hazardous Materials, 163, 174-179. 14. Aghazadeh, M., and Hosseinifard, M. (2013). “Electrochemical preparation of ZrO2 nanopowder: Impact of the pulse current on the crystal structure, composition and morphology.” Ceramics International, 39 (4), 4427-4435. 16. Lijing, D., Zhiliang, Z., Hongmei, M., Yanling, Q., and Jianfu, Z. (2010). “Simultaneos adsorption of lead and cadmium on Mno2-loaded resin.” J. of Environmental Science, 22(2), 225-229. 18. Ho, Y., Wase, D., and Forster, CF. (1996). “Kinetic studies of competitive heavy metal adsorption by sphagnum moss peat.” Environmental Technology, 17(1), 71-77. 19. Othman, H., Yue, Z., and Charles J. Banks. (2012). “Thiol-functionalised mesoporous silica-coated magnetite nanoparticles for high efficiency removal and recovery of Hg from water.” Water Research, (12), 3913-3922. 20. Jooyoung, S., Hyeyoung, K., and Jyonjsik, J. (2011). “Adsoption of heavy metal ions from aqueous solution by polyrhodanine-encapsulated magnetic nanoparticles.” J. of Colloid and Interface Science, 359, 505-511. 21. Langmuir, I. (1916). “The constitution and fundamental properties of solids and liquids.” Part. 1. Solids, J. of Am. Chem. Soc., 38, 2221-2295. 22. Freundlich, H.M.F.(1906). “Over the adsorption in solution.” J. of Phys. Chem., 57, 385-470. 23. Bystrom, A.M. (1949). “The crystal structure of ramsdellite, an orthorhombic modification of MnO2.”Acta Chem. Scand., 3 , 163-173. 24. Zwicker, W.K., Meijer, W.O., Groeneveld, J., and Jaffe, H.W. (1962). “Nsutite, a widespread managanese oxide mineral.” Am. Mineral Ogist, 47, 246-266. 25. Ananth, V., Pethkar, S., and Dakshinamurthi, K. (1998). “Distortion of MnO6 octahedra and electrochemical activilty of Nstutite-based NnO2 polymer Phs for alkaline electrolytes-an FTIR study.” J. Power Sour, 75, 278-282. 26. Malkoc, M., and Nuhoglu, Y. (2005). “Investigation of Ni(II) removal from aqueos solution using tea factory waste.” J. of Hazard. Mater., 127, 120-128. 27. Ozcan, A., and Ozcan, A.S., Tunali, S., Akar, T., and Kiran., I. (2005). “Determination of the equilibrium, kinetic and thermodynamic parameters of adsorption of copper(II) ions onto seeds of Capsicum annuum.” J. of Hazard. Mater., 124, 200-208. 28. Mobasherpour, I., Salahi, E., and Pazouki, M. (2011). “Removal of divalent cadmium cations by means of synthetic nano crystallite hydroxyapatite.” J. of Desalination, 266(1-3), 142-148. 30. Herrero, D., Arias, P.L., Cambra, J.F., and Antuٌano, N. (2011). “Studies on impurity iron removal from zinc electrolyte using MnO2-H2O2.” Hydrometallurgy, 105, 370-373. 31. Shih, H., and Dong, H. (2009). “Rapid removal of heavy metal cations and Anion from aqueous solutions by anamino-functionalized magnetic nano-adsorbent. ” J. of Hazardous Materials, 163, 174-179. 32. Donglin, Z., Xin, Y., Hui, Z., Changlun, C., and Xiangke, W. (2010). “Effect of environmental conditions on Pb(II) adsorption on-MnO2.” Chemical Engineering Journal, 164, 49-55. 33. Özacar, M., and Sengil, I.A. (2005). “Adsorption of metal complex dyes from aqueous solutions by pine sawdust.” J. of Bioresource Technology, 96(7), 791-795. 34. Rawajfih, Z., and Nsour, N. (2008). “Thermodynamic analysis of sorption isotherms of chromium(VI) anionic species on reed biomass.” J. of Chemical Thermodynamics, 40(5), 846-851. 35. Meng, X., Hongjie, W., Di, L., Dan, Q., Yujia, Z., and Yili, W.(2013). “Removal of Pb(II) from aqueous solution by hydrous manganese dioxide: Adsorption behavior a mechanism.” J. of Environmental Sciences, 25(3), 479-486. 37. Katal, R., Hasani, E., Farnam, M., Sharifzadeh, M., and Ghayyam, A. (2009). “Charcoal ash as nanoadsorbent for Ni2+ adsorption and its application for wastwarer treatment.” J. of Chemical and Engineering Data, DOI: 10.1021/Je 200953h. 38. Mungapati, V.S., Yarramuthi, V., Nedavala, S.J., Alla, S.R., and Abburi, K. (2010). “Biosorption of Cu(П), Cd(П) Pb(П) by Acacia leucocephala bark powder Kinetics, equilibrium and thermodynamics.” Chemical Engineering J., 157, (2-3), 357-365. 39. Keskinkan, O. (2004). “Heavy metal adsorption properties of a submerged aquatic plant (Ceratophyllum demersum).” Bioresurce Technology, 92, 197-200.